Beignets are commonly known in the U.S. as a dessert served with powdered sugar on top. They are traditionally prepared right before consumption to be eaten fresh and hot. Cafe Du Monde, the original French market coffee stand, serving cafe au lait and hot beignets (French doughnuts) 24 hours a day, year round. This familiar New Orleans landmark has been located in the French market since 1862. Beignets are commonly known in the U.S. as a dessert served with powdered sugar on top. They are traditionally prepared right before consumption to be eaten fresh and hot. 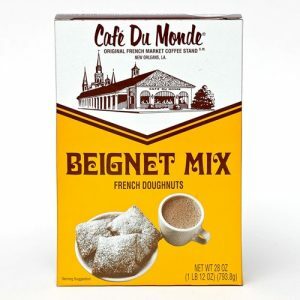 This beignet mix is authentic and is the same mix used at Cafe Du Monde, the original French market coffee stand, serving cafe au lait and hot beignets (French doughnuts) 24 hours a day, year round. This familiar New Orleans landmark has been located in the French market since 1862. 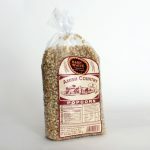 Contains: Enriched Wheat Flour, Enriched Barley Flour, Milk, Buttermilk, Salt, Sugar, Leavening (Baking Powder, Baking Soda, and/or Yeast), Natural and Artificial Flavoring.